Since early 2006, porcine epidemic diarrhea virus (PEDV) has been reemerging in immunized swine herds. Open reading frame 3 (ORF3) is the only accessory gene in the PEDV genome. The entire ORF3 genes of 12 PEDV field strains and one vaccine strain were sequenced. The ORF3 genes of Chinese PEDV field strains (excluding CH/GSJIII/07) contain a single 672- or 675-nucleotide (nt) ORF, which encodes a 223- or 224-aa-long peptide. However, the CV777 vaccine strain and CH/GSJIII/07 contain a 276-nt ORF because of a 49-nt deletion at nt 245–293. The Chinese PEDV field strains and PEDV reference strains are divided into three groups based on the phylogenetic relationship of their ORF3 genes. Chinese PEDV field strains (excluding CH/GSJIII/07) have a close phylogenetic relationship to Korean strains and are genetically different from the PEDV vaccine strains. 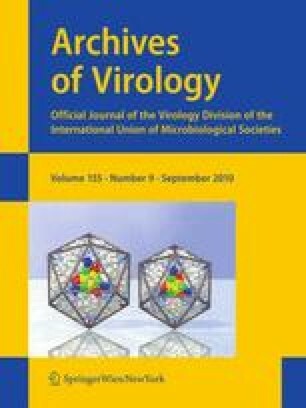 However, CH/GSJIII/07 has a close phylogenetic relationship to two vaccine strains, suggesting that it might have evolved from a live vaccine strain. Chinese PEDV field strains (excluding CH/GSJIII/07) can be differentiated from PEDV vaccine strains by a nested RT-PCR method. This study was supported by National Key Laboratory of Veterinary Biotechnology (NKLVBP200805), National Natural Science Foundation of China (30901081), and National Key Technology Research and Development Program (2006BAD06A07). We also thank Dr. Tongqing An for providing ClustalX v1.83 and MEGA 4 softwares and giving advice.